Jess gets crafty: Yarn stash overload! Today I've been left to my own devices as I had booked this day off thinking I would be worn out after all the skiing... but as I seem to have far too much energy I've been getting up to all sorts of mischief. 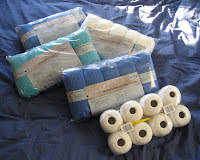 Rich called me this morning to let me know that our local Lidl store had some cheap wool in and so off I went to have a look. Instead of being sensible and only purchasing one or two bags, I went completely overboard and bought four large bags of yarn and 8 balls of crochet cotton!